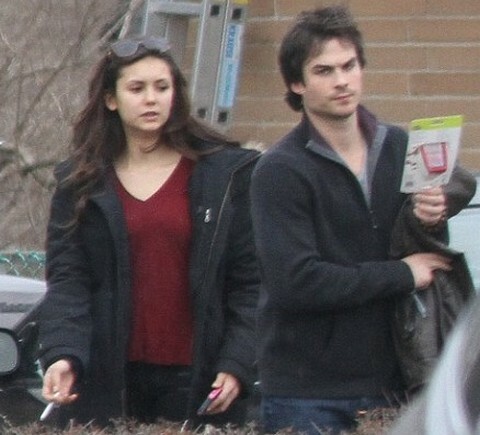 See, Nina and Ian aren’t getting along very well, right now. I mean, it’s not hard to decipher why they’re not getting along, considering their romantic history and Ian flaunting his new girlfriend, Nikki Reed. In fact, you have to commend Nina on her restraint in not quitting the show, and actually trying to stay professional with her ex-boyfriend while he and Nikki Reed engage in on-set PDA. But even so, their on-set tension has had some consequences, most notably spilling into the actual story and plotlines for The Vampire Diaries. They’ll never admit it, but the writers always take into account these sort of precarious relationship situations and work around them. For example, after Chad Michael Murray and Sophia Bush divorced on One Tree Hill [because he cheated on her, no less], the writers were forced to abandon their end game of those characters ending up together and putting Chad with someone else instead. In the same way, Elena and Stefan have now become the show’s major pairing again, even though it’s been a few seasons of Elena and Damon, Elena and Damon, Elena and Damon. But for Season 6, Damon’s gone missing, and it’s now all about Stefan and Elena. It’s not a coincidence, even if everyone pretends that this was their main plan all along. They know that Ian and Nina wouldn’t have been able to force themselves through several love scenes, over and over again, and so they made it easy on the actors. And let’s just say the show gets renewed for another couple of seasons? Well, I wouldn’t hold my breath for Nina or Ian to sign on.